Today was a relatively quick planting day. Matt and I popped in 5 Hesperaloe parviflora "Yellow" up at the top of PRG, added a Yucca elephantipes and a Yucca guatamalensis, and cut back some seriously unruly Santolinas. Hesperaloe parviflora (aka Hesperoyucca parviflora) is a really tough desert plant and we have another group of five to go in, except this time a red color, elsewhere at PRG. Hope they do well! And yet more plants planted - what a day. Matt and I returned to PRG today and started at 10am. We worked til 1.30pm, then had a break for lunch (garlic noodles at Sunflower!) and resumed until about 3pm I think. I am SO tired! First we put in five Agave neomexicana. This is a cute little blue-gray agave that should produce lots of babies for us - more agaves everywhere! We moved a Yucca elephantipes to make a group with another one. For some reason people keep cutting off the flowering tops of these yuccas, which is pretty sad because it takes at least a year for them to look good again. We cut back some Artemisias, Santolinas and Perovskias, and put a lot of weeds into bags. We also rounded up a mattress and other trash that was dumped. I put in a separate 311 for that (to go with the one for the weeds) and it was already closed as they apparently picked the stuff up - great news. 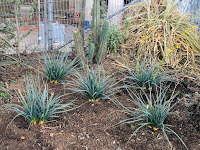 We planted five Agave "Blue Flame" - a nice, softer-leaved agave - around the bottom end of PRG, and hopefully they won't get too beaten up there. 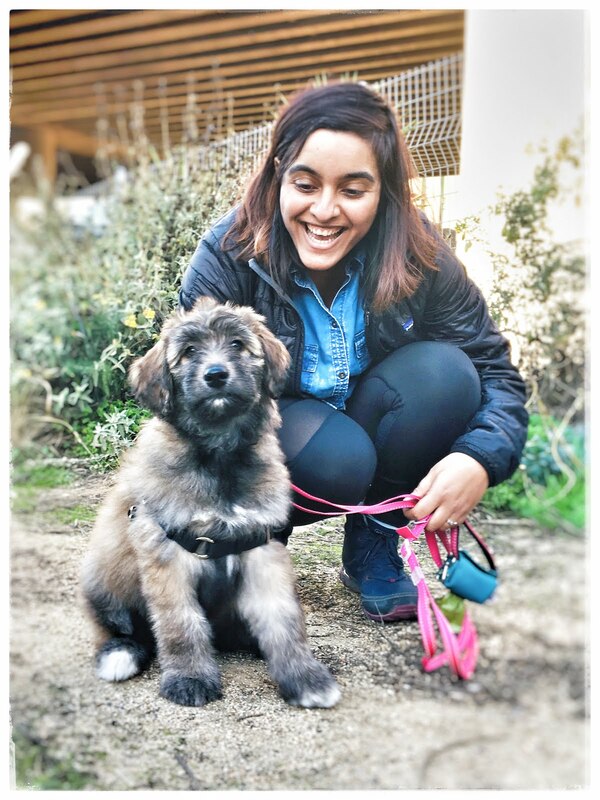 That variety tends to suffer from broken leaves if people or dogs walk into them. Fingers crossed. Down at the bottom behind the kiosk (and close to the five Agave "Sharkskin" we put in this week) we placed three rather small Agave gentryi, which is a very spiky and toothy species. These will grow pretty big, so they're spaced quite far apart right now. Lastly we planted three Agave impressa closer to the top of the garden. Again, this is a medium-large agave at about 3-4 wide eventually, but the ones we put in are under 12" wide. They should get up to size in a few years. More new plants have been installed! Go check 'em out - it's been a veritable festival of planting this week as Matt and I have been out there every day since Wednesday, and more is to come at PRG. 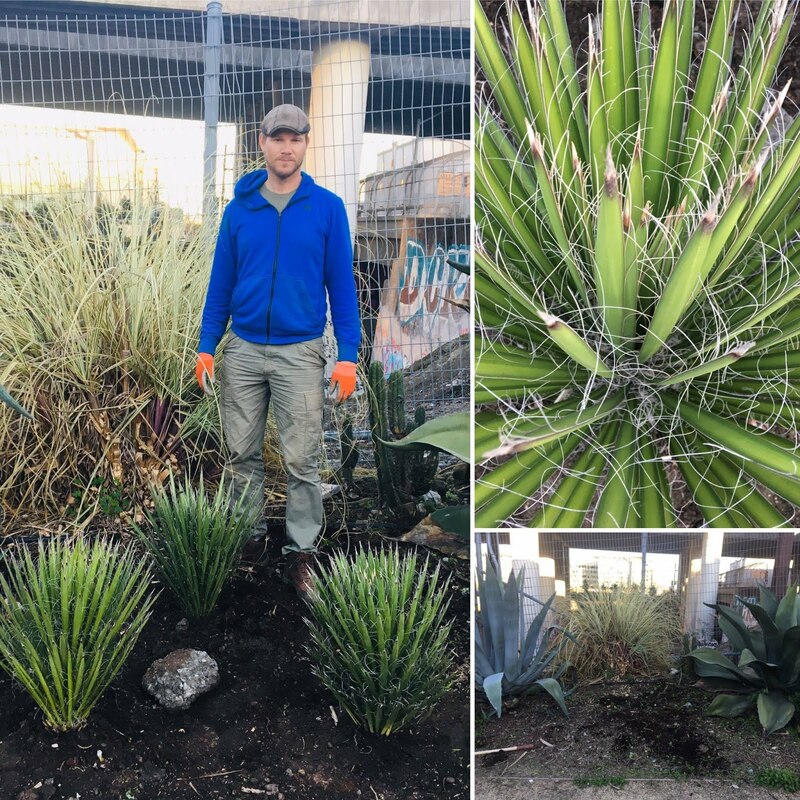 First up, today we planted a gorgeous group of five Agave stricta (Hedgehog Agave) plants - these ones are ultra, super spiky so don't go cuddling them... weeding around them will be a real pleasure too. Let's just say we are planning to get a load of mulch to keep the weeds down really soon. 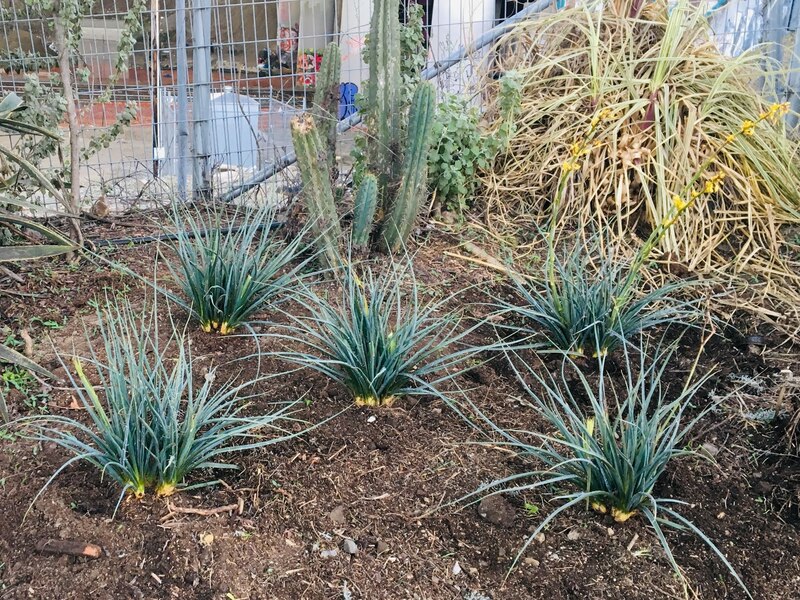 They're planted right by an Agave vilmoriniana "Stained Glass" (Octopus Agave) which is funny - Hedgehogs and octopi! Up the street a little way is a group of six Agave parryi we also installed today. This one is a real favorite of ours, with lovely gray-blue leaves and a nice round shape, and we should see babies sprouting up from them soon enough. Yesterday we put in quite a few new plants too. We made a group of five Agave "Sharkskin" behind the kiosk at the bottom of the garden. This one has lovely gray and smooth leaves. We also moved four Ochagavias to a better group, combined several groups of Dietes bicolor together to make a nice area for them, pulled out a lot of dead Euphorbias and weeded and weeded and weeded... yes, the pile of debris for Recology to take is huge, but they haven't responded to the 311 request yet, so bear with us. We put in three Yucca filifera at the top of the garden, right between two massive Agaves. They look pretty smart - one day they will be tree-sized but it will be a VERY long time (decades...) so don't hold your breath. OK that's it for today. More to come tomorrow - if you want to join us, feel free! We'll be there from mid-morning on. New Agaves going in for the holidays! Today Matt and I decided to plant some of the new plants we've received for PRG. We have about 230 plant to go in, so this will take some time... today we planted 10 Agaves, and did an inventory of plants and planting plans at that garden. First of all we walked down the street and checked the planting plan once again, making adjustments. Then we set about clearing weeds from two areas, and planting five Agaves in each spot. One is a set of five Agave bovicornuta (Cow's Horn Agave) which is a really beautiful Agave with red teeth. The other is a group of six Agave ghiesbreghtii with their lovely striped leaves and white teeth. 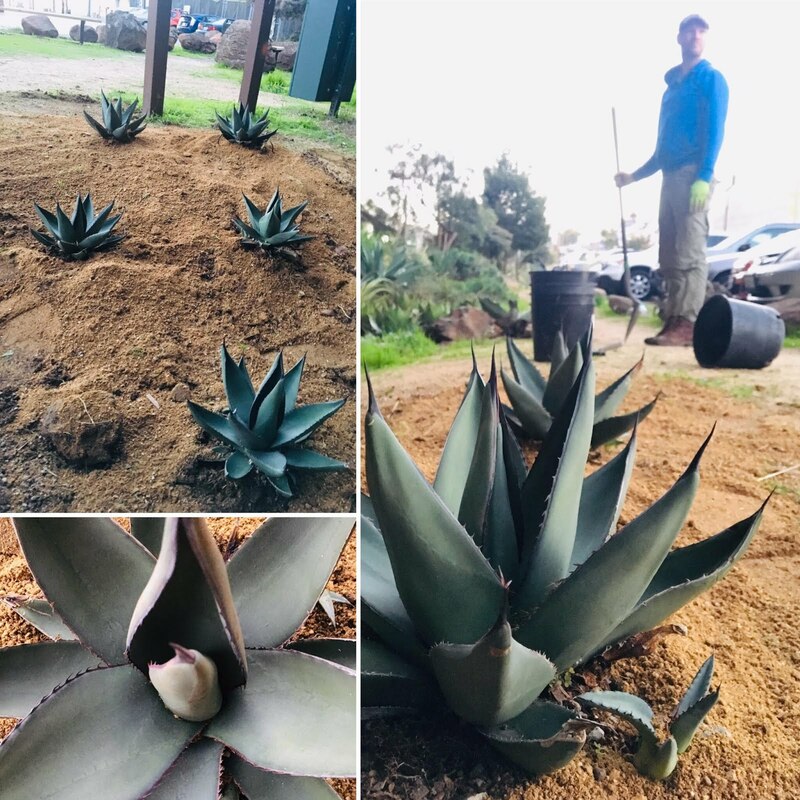 We moved an Agave lophantha to the top of the garden to make room, and put in a 311 for all the masses of weeds Chris and Carrie have been cleaning out of the beds so diligently. The weeds are coming out so easily now, after all this rain, and adding new plants is really fun. Makes for a rewarding session. We'll try and do some more tomorrow afternoon. Plants are on the way! A big order of new plants is on the way, and should arrive next week. Over 200 plants! Along with all the plants we have propagated this year, we will have quite a number of plants to go in the ground this winter, allowing the winter rains to water them in. Planting is always my favorite part of gardening, so the next couple of workdays will be great fun. Why do we need so many plants, you ask? They were damaged by homeless encampments, theft or other damage. Sad. They are still alive, but they're not as drought tolerant in that particular spot as we had hoped (Kniphofias, for example) so we will remove them and replace with something else. They died for no known reason - we will move the remaining ones into groups and give them another shot. That's pretty normal on the whole, and I'm pretty pleased with our plant selections overall. So we will replace the ones we expected to replace, remove the ones that don't really want to live at PRG, and bring in new plants to replace them. And as mentioned I've got lots of "free" plants we made from cuttings to add to the mix, so that will help. 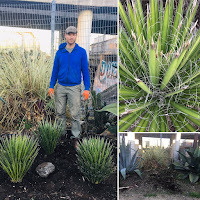 A lot of the new plants will be types of Agaves we haven't grown before - small to medium sized ones which should be very happy at PRG, and super tough plants overall. I also ordered a few new plants to put at PG too, while I was shopping. It's going to be an exciting winter! Our monthly Volunteer Day dawned this past weekend with overcast skies, but the weather soon turned to glorious sunshine! Quickly followed by a blast of cold rain. Then more sunshine! Despite all this variability, we had a great team out to help out at the volunteer day. The plan was to finalize much of the weeding as possible, to prepare for planting the large plant order I've made which will be coming in in the next couple weeks. These new plants will fill gaps where previous ones died or otherwise disappeared. So we set to work! Matt moved some cacti, and Chris removed a dead tree. Sarah, Hilary, Carrie, Josh, Leslie and I weeded like mad, and made a vast pile of weeds which I put into a 311 request to pick up.